With Spring in full bloom and Easter just having passed, one great classroom theme for this time of the year is bunnies. It’s a theme that lends itself well to speech rooms, as there are tons of books and board games to use with it. 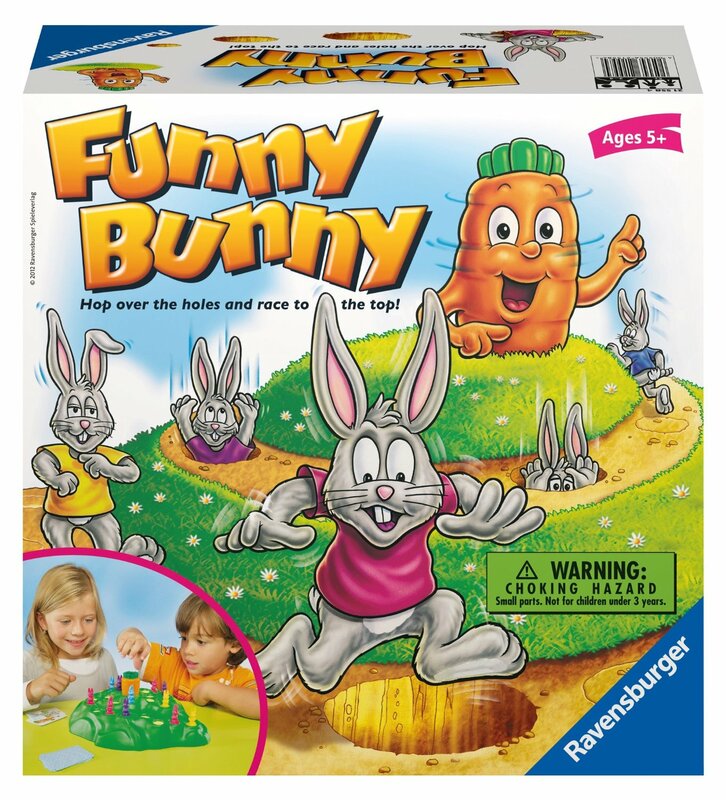 I recently received Ravensburger's "Funny Bunny" to test out with my students, and it was an instant hit! Funny Bunny has an attractive set up, is easy to learn, and promotes great turn-taking and sportsmanship skills. What’s not to love? Funny Bunny is recommended for ages 5 and up and can be played with 2-4 players. The game consists of a game board, 24 cards, and 16 bunny figures in four colors. The board consists of a 3-dimensional base shaped like a hill. Little paving stones lead up to a carrot at the top of the hill. The goal of the game is to be the first player to get their bunny to the carrot without falling into treacherous holes along the way. All players start with four of their bunnies at the base of the hill. On their turn they pick a card from the top of the deck. There are two different types of cards: bunny cards indicating how many spaces players get to move, and carrot cards. When players pick a bunny card, they move one of their bunnies according to the number of spaces shown on the card (one, two, or three). If players get a carrot card, they need to spin the carrot. 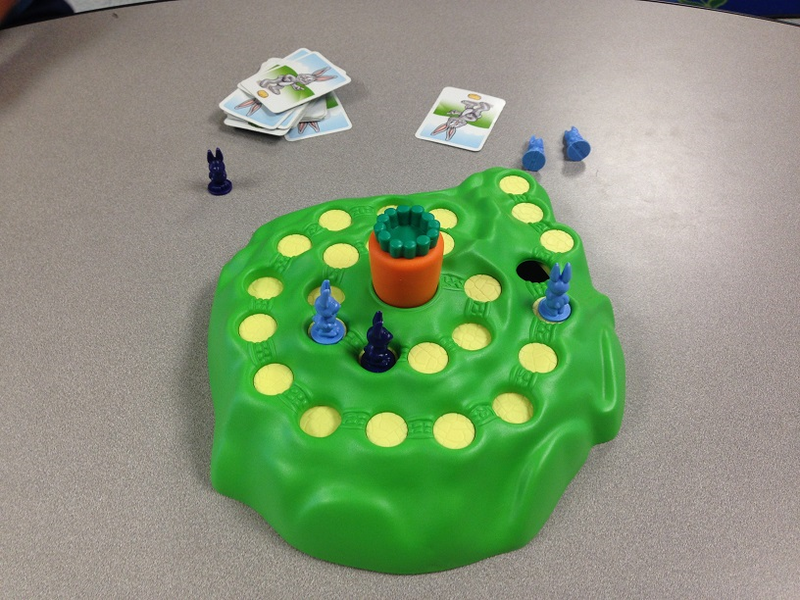 This is where it gets interesting: spinning the carrot causes holes to appear on the game board. If a player’s bunny is on a space that is turning into a hole, the bunny will fall in and the player needs to start over. Players can also choose to have multiple bunnies on the board at the same time. For example, if a player receives a card that allows them to move one space but that space is a hole, they may choose to move a new bunny onto the board. My students loved the suspense of finding out where the hole would appear next when a carrot card was drawn. I am used to Ravensburger games being high quality, and this product is no different. The base is solidly constructed. Just be mindful that the carrot only spins one way (if you force it the wrong way, it might break). The cards are somewhat thin, so if you are planning to use this game a lot (i.e. a classroom setting), you may want to consider laminating them for additional durability. 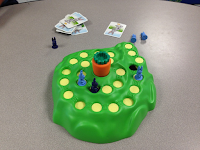 Funny Bunny a great game to work on planning and strategizing, as some spaces are “safe” and other spaces have the potential to become holes. Players should move their bunnies in such a way to avoid the unsafe spaces. One of the pros about this game is that the game uses cards instead of a die. That way, you can “rig” the game and manipulate the deck to control whether a player will fall into a hole or not. With some practice, you will be able to predict which space will be a hole next, so you can further manipulate the game. That way, if you have students who are sore losers, you can purposely let them fall into a hole to work on sportsmanship (yes, it’s kind of mean, but a skill many of my students need to work on). To make this game more challenging, you could add the rule that you can only have one bunny on the board at a time. Funny Bunny is also a great choice for younger students working on specific speech therapy targets such as Final Consonant Deletion. You can have them practice words like “hop”, “carrot”, “spot”, “rabbit”, “top”, “in”, etc. You can also target positional concepts, including “under”, “on top”, “in”, “in front”, “behind”, and “between”.